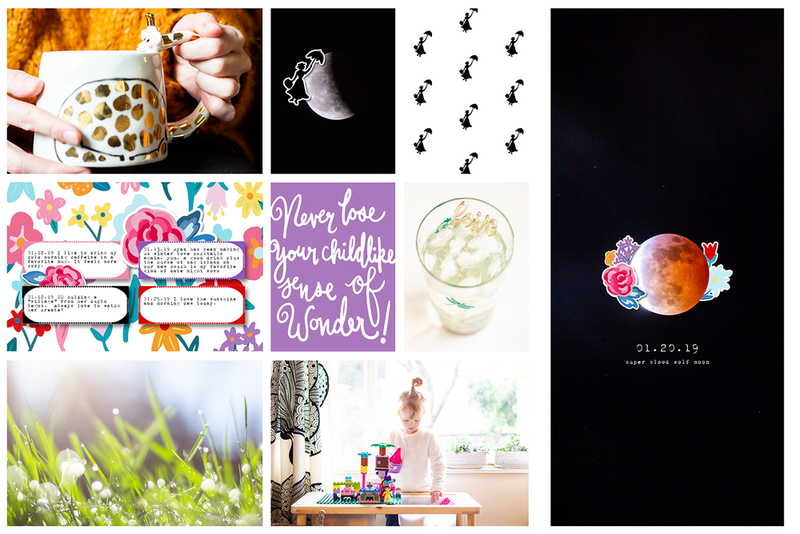 Hi there crafty people, Kellie here with you today to share a scrap layout I created using the new, Practically Perfect kit. I love this kit. Every time I think Andrea can't possibly out do herself and BAM she goes and does it again. I don't think you even have to be a fan of the movie this kit is based on. I remember watching it as a kid, but I know I can use this kit over and over again. I started with a white cardstock base. I did consider going with a pattern, but when I laid eyes on the Spoonful of Sugar acetate, I knew I had to use it. One side gold the other blue, WINNING. When I spotted the tag I just knew I couldn't hoard it as much as I really wanted to, because it's gorgeous. So instead I got out all my favourite elements and added them to this layout. This is the end result and I coudn't be happier. 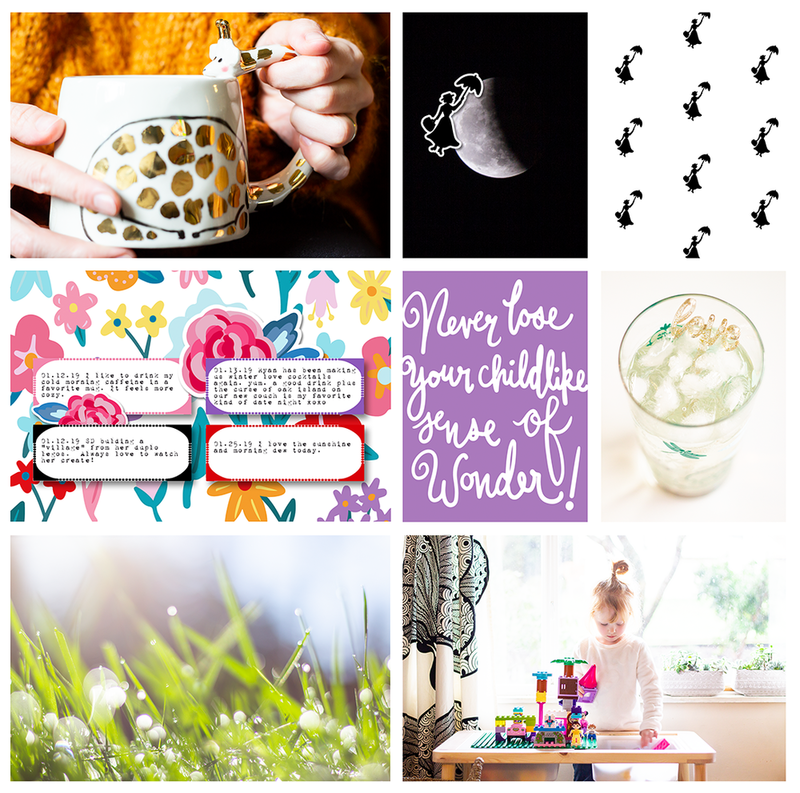 Hey there crafty peeps, Kellie here with you to share a layout I created. So when this gorgeous kit arrived, You + Me I knew right away that anything I created would not involve my husband what so ever. I'm not alone in the craft world where their husbands don't like their photo being taken, rarely, if at all? I mean after doing a podcast once and attending a couple craft retreats, I found out a lot of people thought I was a single mum. I can promise, he's real, haha. So I knew right away this kit is going to be used for the people I love, that let me take their photo or a photo with them, haha. This girl I love to bits. We met online because of crafting, CRAZY right? It's been almost 10 years now, WHOA ok, I didn't realise that, haha. I scarp in the size of 6x8. It can be a challenge sometimes because I want to add more, but I've tried so many sizes over my time in crafting and 6x8 I just love. Usually with a typical white cardstock background, NOT this time! I absolutely loved to pattern with the pink and the lined paper look that I just knew I ad to use that as the background. I love using instax photos when I scrap? I don't know why, maybe because of the smaller size, but the photos just GO with the style I do. Do you pick your photo first or are you the type that picks what you will use first and then go from there? I personally pick a photo first. After I've picked the photo I always go to the die cut ephemera, then more pattern paper, strips, and stickers and layer and layer as I go. Once I'm happy I take a happy snap so that I can then remember where everything goes. There have been many a times that I've walked away for some reason or another and then come back and completely forget where I had things. i do this for almost everything, project life, cards and layouts. highly recommend it. After all that this is the final result and I'm super happy with how it all came together and the kit just WORKED so well for my plan. Hi all Aimee here, hoping you had a great Christmas and New Year! 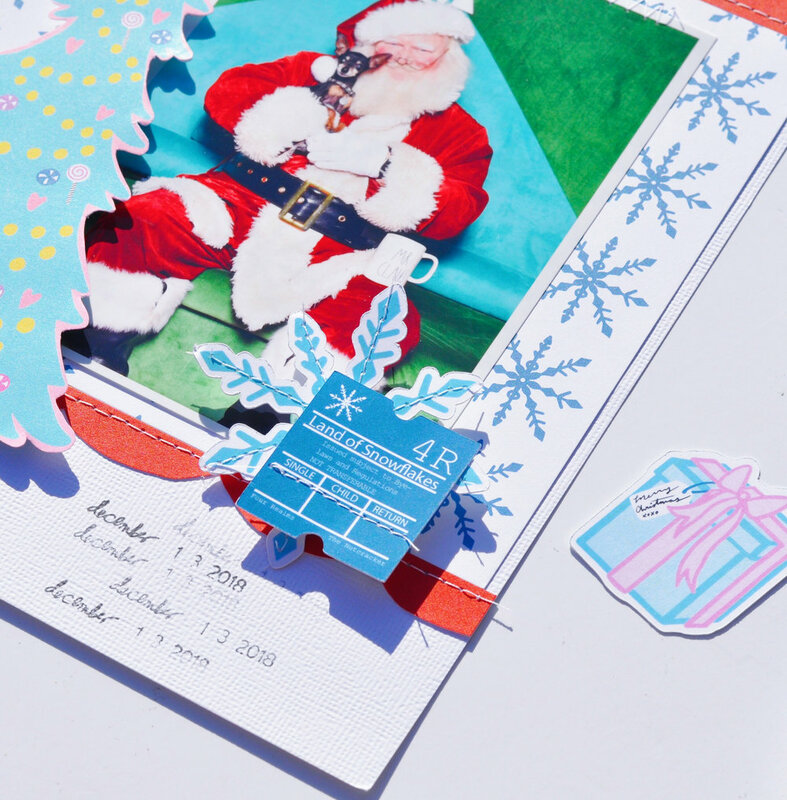 Today I’m sharing a layout I made using the “December Dreams” Kit. I took my little dog Jager to see Santa at the Mall and of course I had to scrap it! My layout is an 8.5 x 11 and I used an A5 dashboard from the December Dreams kit as my back ground. Who knew that an A5 dashboard fits perfectly onto an 8.5 x 11 layout! I fussy cut the tree from another one of the A5 dashboards. Using some 3-d adhesive foam, I layered it over my photo. (Don’t forget that cute little deer that’s layered over the tree.) I also cut some scallops from “Land of Snowflakes” and stitched them to the top and bottom of that A5 dashboard. When I was stitching the scallops on to my cardstock, I also stitched on a snowflake and “ticket” from the die cut pack for fun. I also used 3-d foam adhesive to pop them up and layer them on top of my photo. Next I took “Merry” + “Christmas,” and, using more 3-d foam adhesive, I placed these die cut words at the top of my page. To finish off my layout I used a date roller stamp to date the visit to Santa. Do you take your pets to see Santa? Hey all Aimee here on the eve x2 of Christmas Eve, Say What? Really it’s a thing! 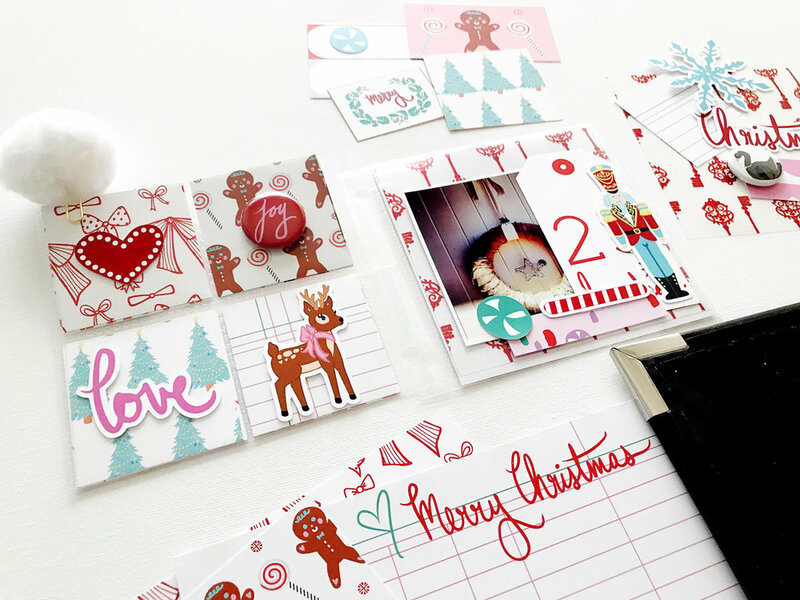 Anyways, I am throwin’ it back today with a Christmas layout using the “December Dreams” kit. This photo of my husband and I was taken at Disneyland in 2009. Look how skinny he was! We started dating in 2009, so at that time he really didn’t say no to Disneyland. I remember dragging him to Disneyland the week of Thanksgiving that year. I think he about killed me. But I’m so happy I have these photos and memories. I really went out of my comfort zone with this layout. I rarely use such a busy background for my layouts. For my 8.5 x 11 layout, I started off my trimming down the clear acetate sheet “You Have the Key” to fit inside my white cardstock. Next I used one of the A5 dashboards to give my layout a nice pop of red. I layered some of the die cuts with 3-d adhesive foam, in different thicknesses at the bottom left corner of my page. For another added affect, I added some red eye lash thread amongst my die cuts. I used my tiny stapler to attach the thread to my layout. And don’t forget the tiny die cut stars that I stapled to the top left side of my layout! Thanks for taking the time to stop by the blog today, I’m sure you have a ton of things to get done before the BIG day next week. Do you have all your shopping, decorating, crafting done? Kellie's 4x4 Mini-Layout with "December Dreams"
Hello everyone! 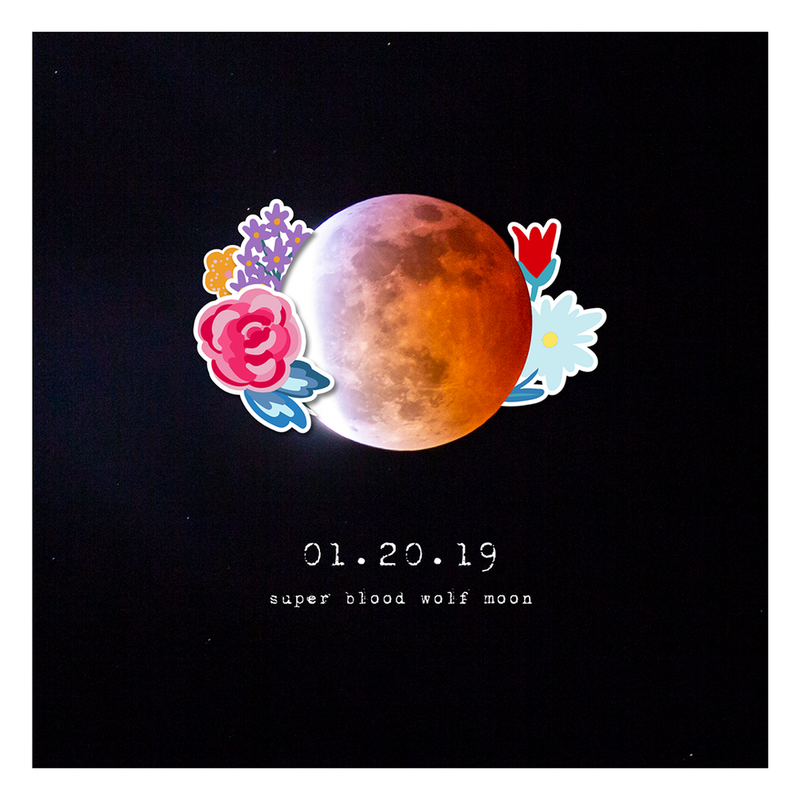 It's Kellie here to share a mini layout I created in a 4x4 mini album. These little albums are the best for documenting your memories. They can be used for one theme or many. I decided to use one for just whatever I feel like at the time - no theme, no reason, just getting creative. Which is exactly what I did this month with the NEW December Dreams kit. If you haven't already, subscribe! Although it’s too late for your subscription to include the “December Dreams” kit, you can still purchase most of the separate components from this kit, and each time the kits keep getting better and better, so by subscribing now you won’t miss out on future kits. The acetate sheet that comes with the kit is gold on one side and a red on the back. I mean HOW awesome right!? I've used the red side here. I fiddled with the gold but it wasn't working, and then once I turned it over, the whole thing came together. I've used a instax photo from a snap chat photo my girls sent me almost 3 years ago now, boy how times go on by! After I decided on the photo it was time to get busy. I like to layer, or clutter, depending on how you look at it, then have open space. I don't know why, but it's always the look I generally go for. This layout came together so easily, and I really feel it's because when you love to work with something it makes it so much easier.